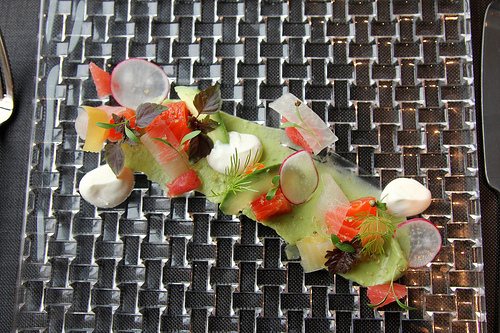 Behind the French Menu: Truite - Trout, the Fish. Trout in French Cuisine. Truite - Trout, the Fish. Trout in French Cuisine. Photograph courtesy of Simon Aughton. Trout will be on many menus in France, not just that of specialist fish restaurants; even that small restaurant on the corner may have trout on the menu once a week. France’s extensive river systems allow lake and riverside restaurants the opportunity to regularly put wild brown trout on their menus. Farmed rainbow trout, Truite Arc-en-ciel, may be on any local restaurant's menu every day. Do not allow the opportunity to enjoy the way France prepares trout to pass you by. Trout are related to salmon, but despite that relationship, they have a large family of their own, and certainly smaller trout have tastes and textures that are decidedly different to salmon. These smaller members of the trout family are often at their best when simply fried or grilled, though French chefs will delight in showing a wide variety of recipes. 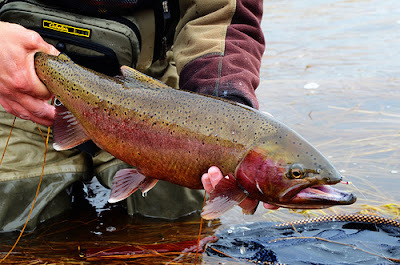 Large trout may be prepared with dishes created for salmon, and while most trout have ivory colored flesh salmon trout and some farmed trout are pink; the pink color of both wild and farmed trout is a result of their eating habits. 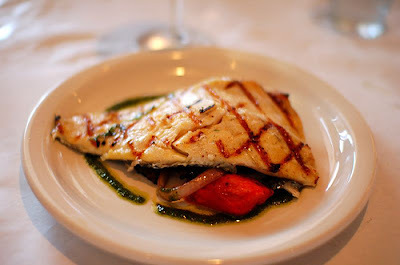 This post includes the trout that are most often seen on French menus. 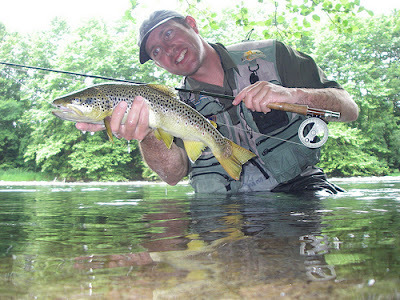 Other wild trout may occasionally be offered and then you may have a special treat. Rainbow or Steelhead trout are also called Kamloops trout, Salmon trout, Summer Salmon and Coast Angel Trout. This trout is sometimes called the salmon trout in North America; however, the fish called salmon trout in Europe are a completely different member of the trout family. The rainbow or steelhead trout will be on menus around the world, and in France, probably 90% of the Truite Arc-en-cel, rainbow trout, will have been farmed; most of the others will have been caught in rivers and lakes that have been stocked. Rainbow trout have a firm flesh with an excellent taste and when the menu just says trout without any additional names, then the trout on the menu is rainbow trout. 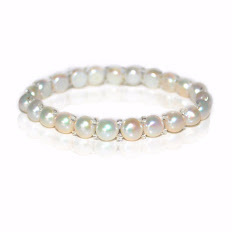 The majority of these fish are sold when they weigh less than one kilo though rainbow trout may grow to over 20 kilos. Truitelles, on a French menu, are young trout, usually young farmed rainbow trout. Rainbow trout on the menu. La Truite Fumée en Genévrier avec Raifort à la Crème avec Airelle, Toast et Beurre – Smoked rainbow trout flavored with juniper berries and served with a cream of horseradish sauce along with European cranberries, and served with toast and butter. Most French chefs do their own hot smoking and trout will be lightly smoked over birch wood. Smoked trout is very very different to smoked salmon, which is cold smoked. Hot smoking both smokes and cooks the trout at the same time, and depending on the size of the fish most can be smoked in thirty minutes or less; cold smoking is carried out over a period of days. Smoked trout is a great entrée, the French first course, and is nearly always served cold. Truite aux Amandes - Rainbow trout cooked with almonds. This dish is usually lightly fried; however, it may be grilled if requested. Truite au Bleu avec Beurre Fondu et Pommes de Terre - For Truite au Bleu the fish must be killed just seconds before it is dropped into a boiling broth; that causes the skin to turn to a steel blue color, au bleu; the fish will be cooked and ready to serve within five or six minutes. On the menu listing above the trout is served with melted butter and potatoes. 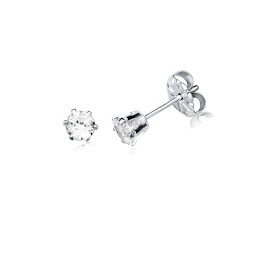 Photograph courtesy of ulterior epicure. Terrine de Truites aux Asperges – A pate of rainbow trout, almost certainly made with smoked trout and served cold as an entrée; here it is served with asparagus. With a dish like this ask how the pate is made. Truite au Gewurztraminer - Rainbow trout cooked in a Gewurztraminer wine sauce. The Alsace is home to many trout farms, and the Alsace also has with many rivers and lakes where brook and other trout may be caught. The Alsace is also home to some of the France’s finest white wines; the AOC wines of the Alsace are also unique in that these wines are among the very few that France permits to be sold under the name of the grape used. Gewurztraminer is a wonderfully scented semi-dry white wine and perfect for accompanying trout or being used to cook it with. Truite Farcie aux Fine Herbes - Rainbow trout stuffed with the herbs from the most respected French herb group les fine herbes; these herbs will provide a fresh a distinctive yet very mild flavor. The fine herb group is France’s oldest, and still the most popular, herb group, and includes Cerfeuil – chervil; Persil – parsley; Ciboulette – chives; Thym– thyme and Estragon – tarragon. Truite bio AB de Nant, Marinée, Pousses d'Épinard et Vinaigrette à l'Huile d'Amande - Organically raised, marinated, farmed, rainbow trout served in an almond oil vinaigrette flavored with spinach shoots. 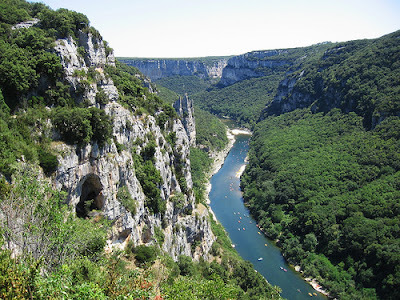 Nant is a town in the département of Aveyron in the Midi-Pyrénées, next to the River Dourbie and less than 30 km (19 miles) from the five glorious lakes of Levezou which have both wild and stocked trout and are also a very important water-sports center. France leads the world with the number of with organically farmed-trout, and if you look for organic trout in France the wording organic is not enough; you need the government approved green initials AB if you want to be sure. The French organic AB logo left. The Pan European organic logo, right. There is careful control over organic agriculture, including aqua-culture, in France. With organic fish-farming in fresh water, and at sea not only the type of food is controlled along with the banning of antibiotics and growth hormones but also the amount and type of space per fish is controlled. Rainbow trout - (Dutch - regenbooforel), (German – forelle), (Italian- trota, trota iridea), (Spanish – trucha, trucho arco-iris). Brook trout are also called Brook Char, Eastern Brook Trout, Speckled Trout, Speckled Char and Salter. This trout was brought to France from the USA in the 1930’s, and has established itself well and is now a truly wild French trout. 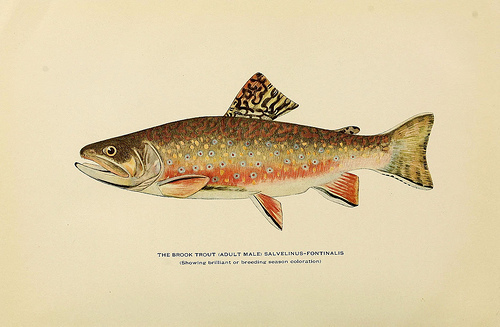 The English names for brook trout, brook char and speckled char cause confusion with fresh water char or arctic char which are related but different fish. The French name for brook trout omble chevalier may also seem similar to the French name omble de fontaine, which is yet another related but different fish. 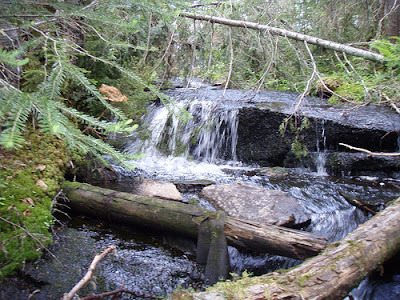 The perfect place for brook trout to hide. Many fish are a part of the greater salmon family and the brook trout is also related to the broad whitefish. The broad whitefish is a very popular lake and river fish and in French called the the Féra, Fera or Palée du Léman; one or more of these tasty trout family relatives may be on the same menu as the brook trout. Saumon de Fontaine des Eaux du Morvan à l'Unilatéral – Brook trout from the waters of the beautiful Regional Natural Park in Morvan, Burgundy. Here, the fish is cooked à l'Unilatéral, that indicates the fish was cooked through from the skin side only. 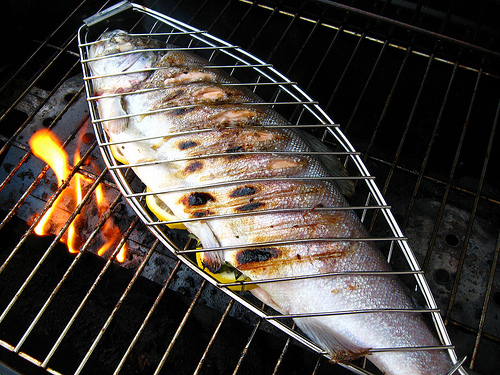 Cooking a filet through the side with skin on is considered a far better way to maintain a fried fish’s flavor; the taste of the fish is much less affected by the butter or oil in which the fish is fried. If this dish is on the menu when you are in Burgundy then visit the Regional Natural Park in Morvan, the Parc Naturel Régional du Morvan, where this fish was caught. The park is a lovely place to drive through, and there is a great deal to stop and explore with lakes, waterfalls, rivers and charming villages. Le Saumon de Fontaine Roti – Baked brook trout. Omble de Fontaine à la Tomate et Fenouil, Pommes Persillées – Brook trout prepared with tomatoes flavored with dill and served with potatoes fried with parsley. Dill, the herb, has a light aniseed flavor and is a very important in French cuisine. (Catalan - truita de rierol, truita de font), (Dutch - bronforel), (German – bachsaibling,), (Italian -salmerino di fontana, salmerino di fonte), (Spanish- salvelino). Lake Trout or Salmon Trout. Lake Trout is one of the two trout most often served with recipes originally created for salmon, the other is the sea trout. The fish called a salmon trout in North American is called the rainbow or steelhead trout in Europe and elsewhere. Truite Saumonée Fumée et sa Compotée d'Oignon au Carvi – Lake trout that was hot smoked; here it is served cold with a compote of onions flavored with caraway seeds. La Truite Saumonée Entière Faite à la Poêle avec Amandes, Beurre Persillé et Pommes de Terre – A whole lake trout lightly fried with almonds and butter flavored with parsley and served with potatoes. . If this is a trout for one person that will hopefully be about a 300 to 350 gram fish, about 200 grams of meat. 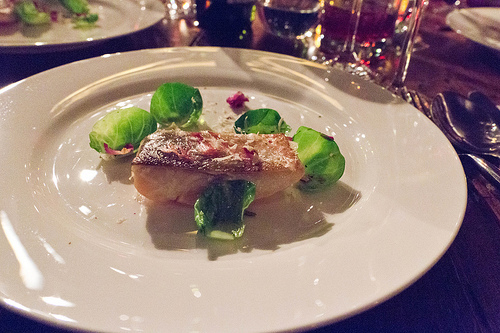 Pan seared lake trout draped with fine slivers of pancetta, rosebuds from France, horseradish and Brussels sprouts. 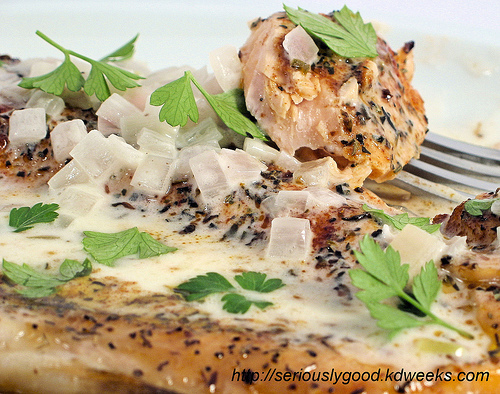 Filet de Truite de Lac Crémeux de Basilic - Filet of lake trout served with a cream sauce flavored with basil. Tartare de Truite du Lac Céleri Rémoulade et Condiments – A trout tartare served with a sauce rémoulade, a mayonnaise and mustard sauce that here is flavored with celery, and served with condiments. The condiments may just be salt and pepper but is probably a more special condiment. Ask. Truite de Lac et Choucroute, en Croûte de Pomme de Terre Cuite au Cumin - Lake trout prepared with choucroute, the Alsatian take on the German sauerkraut, all cooked inside a potato casing flavored with cumin. The lake trout lives in fast flowing rivers and in some lakes. One of its names the truite saumonée, the salmon trout, comes from its pink flesh; the color results from its favorite foods which are crustaceans. Aqua-farmers who farm the rainbow trout also feed them special foods to produce rainbow trout with pink flesh; however, pink rainbow trout taste exactly like the white fleshed rainbow trout. Truite Fario, Truite Commune, Truite de Rivière. The brown trout, also called wild trout, in France's lakes, are land- locked fish restocked under the control of the French government. The taste and texture of brown trout depends on the river or lake along with the type of food that it finds. If you are choosing this fish in a lakeside restaurant where local fishermen bring their catch every day, then you genuinely do not need wonderful chef or a special sauce. This is, I believe the tastiest of all trout and is best when simply grilled or pan-fried in butter. Accompany that wild brown trout with a crisp white wine; and you will not be disappointed. Brown trout on the menu. Truite Fario Poêlée et Son Jus au Bleu d'Auvergne – A brown trout cooked in its own juices and flavored with the Bleu d'Auvergne The Bleu d'Auvergne AOC is a strongly flavored 50% fat, cow’s milk blue cheese. 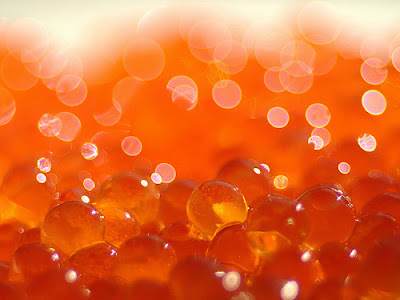 Trout roe; for many that is trout caviar. Filets de Truite Fario du Cusancin Farcie de Morilles, Feuilles d’Épinards – Filets of brown trout caught in the River Cusancin stuffed with morel mushrooms and spinach leaves. The Cusancin river where this fish was caught runs through the département of Doubs in the Franche-Comté. One memorable meal where I enjoyed this magnificent fish was in is a restaurant next to a lake; the fish was delicious as if it had been landed five minutes before; it was served just lightly fried in butter, with a slice of lemon and boiled potatoes on the side. The wine that accompanied the meal was a Tokay Pinot Gris from the Alsace, and that was a perfect match: heaven. Caveat Emptor: I went back to the same restaurant a two years later; the taste was still so fresh, in my mind that I could hardly wait for the fish to arrive. However, this time I was served, a recently unfrozen trout fillet! The disappointment was unbelievable, never will I return; bell, book and candle for that restaurant! Trout farms have also begun to raise brown trout, and if successful that should make this tasty fish more widely available. (Catalan - truita de mar), (Dutch - zeefore), (German - meerforelle), (Italian - salmo trota, trota di mare), (Spanish - trucha común). Sea Trout or Ocean Trout. 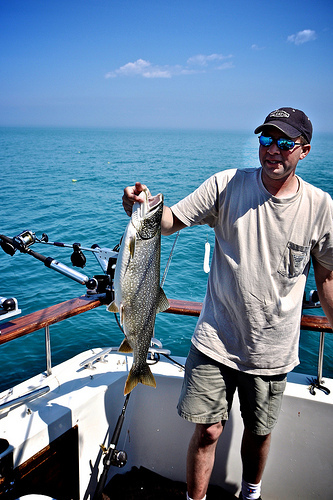 Sea trout are one of the two trout species most often prepared with recipes created for salmon, the other is lake trout. Sea trout is the migratory form of the wild or brown trout and may live for three or four years at sea; they are often caught in a river's mouth when returning to the river to spawn. Sea trout on the menu. Darne de Truite de Mer à la Persillade, Millefeuille de Légumes et Pommes de Terre Poêlées. A thick cut of sea trout cooked with persillade, a sauce of parsley, garlic, oil and vinegar. Served interleaved by vegetables and accompanied by pan-fried potatoes. Truite de Mer Mer Bio AB Marinée au Combawa - Sea trout marinated in the juice of the kafir lime. The sea trout here comes from organic sea-fish farms and in France, so far sea trout is only farmed off the coast of Brittany. Tournedos de Truite de Mer et sa Poêlée de Légumes, Sauce au Pistils de Safran. A large cut of sea trout fried with vegetables and served with a saffron sauce. 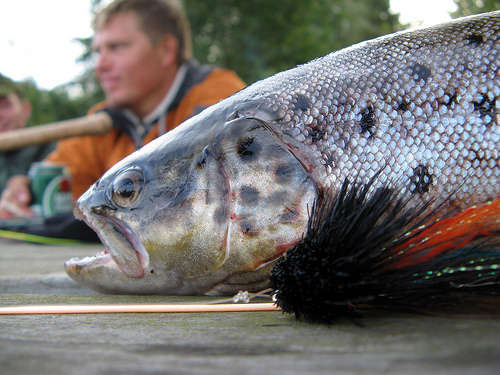 Sea trout - (German – bachforelle, lachförch, lachsforelle, meerforelle). (Italian - trota di mare), (Spanish - trucha común, trucha marina). AOC and PDO. French food and Wine Labels I.
Amande or Almondine – The almond, the nut. The Almond in French cuisine. Bio or Biologique. Aliments Biologiques, Produits Biologiques AB - Organic Food in France. Organic Produce, Organic Meat, Organic Milk, Organic Cheeses, Organic Wines and More. Cerfeuil – Chervil, the Herb, in French Cuisine. Estragon - Tarragon. Tarragon, the herb, in French Cuisine. Fera, Féra, or Palée du Léman.The Broad Whitefish on French Menus. Fine Herbes; the Most Important Herb Group in French Cuisine. Les Fine Herbes on French Menus. Gewurztraminer the white, semi-dry wine. The best is the Gewurztraminer AOP (AOC) from the Alsace, France. Juniper Berries - Baie de Genièvre on French Menus. Berries in France I.
Vinegar, Vinaigrette, and Verjus in French Cuisine.